# Put the eggs and granulated sugar into a deep bowl, and blend it until the sugar dissolves totally. # Add yogurt and vegetable oil into the mixture and mix for a while, add sifted flour, vanilla and baking powder into it, get a smooth mixture. # Grease and flour a little the 8 inches diameter cake mould which has not have a hole in the middle. Pour the mixture into the mould. # Place the mould into the oven which is preheated to 356 F, and bake it for about 40-45 minutes. # Remove the cake from the oven when it gets cooked, when it is cooling down prepare the cream meanwhile. # Blend the icing sugar with cold milk. Add the grated cheese into the mixture. You should place the cheese into too much water one night before using to remove its extra salt. # Add chocolate-hazelnut paste, chocolate chips or grated chocolate into the mixture and mix well. # Remove the cake from the mould when it cools down, and transect it into 2 pieces. Place the first layer of the cake onto the bench, pour half of the mixture all over which is prepared by dissolving 1 tbsp sugar in 1 cup water. # Lay more than half of the prepared cream all over the cake, place the sour cherries on it. # Place the remaining layer of the cake onto the cherries, and pour the remaining syrup all over the second layer. 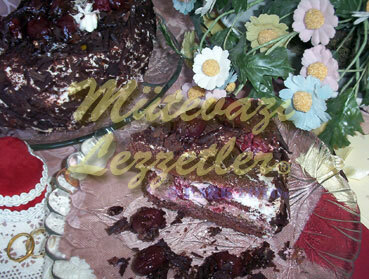 # Cover the cake with cream and garnish it with sour cherries and chocolate. # Refrigerate it on the lowest layer of the refrigerator overnight. Slice and serve. Note: You can use frosted sour cherries also for preparing the cake.